Posted on December 14, 2010 by Jill B. 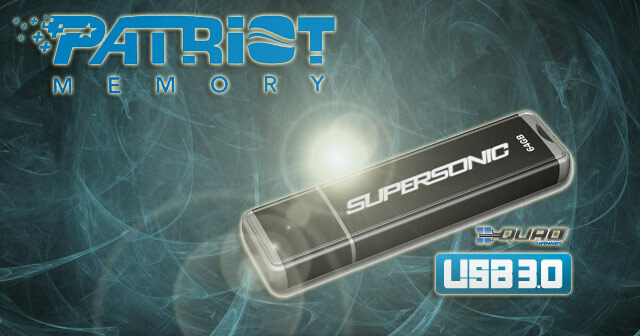 The new Patriot Supersonic USB 3.0 flash drive may look rather ordinary at first glance. The black and metal casing is not nearly as unique or innovative as what’s happening on the inside. According to an engineering executive at Patriot, the company is among the first to take the SuperSpeed interface of a flash drive and push it a step further. The company’s new product aims to demonstrate that going small can have a big payoff. What’s different is that the Supersonic thumb drive uses a single chip USB 3.0 controller instead of a bridge chip. A single chip controller gets rid of any lagging performance issues that occur when a USB 3.0 bridge chip is added to the typical NAND flash controller. An integrated single chip allows for better performance because the data is able to transfer at faster rates with four available data channels and without the need for a bridge. Smaller parts mean that there is more flexibility on the size and design. A single chip flash drive will also not heat up as much as the average device. Single chip USB 3.0 technology can also reduce a manufacturer’s carbon footprint by cutting back on the amount of materials used to build a product. The flash drive’s lightweight shell is a surprising contradiction to its actual durability. Patriot boasts that it can resist shock up to 15Gs. To put that into a little perspective, a space shuttle launches at approximately 3Gs. The Supersonic can read data sequentially at 100MB/s and can write data at 70MB/s. These speeds are comparable to other USB 3.0 flash drive competition, so it is the single chip technology that undoubtedly gives Patriot some edge. The memory stick will be available in 32GB and 64GB capacities. A specific release date has yet to be announced, but Patriot plans on having them ready for consumers to buy in the first quarter of 2011. How do you feel about flash drives with bridge chips versus single chips? Do you think that more SuperSpeed flash drives will start to feature single chip products because of their advantages? Talk to us about it! This entry was posted in Articles, Flash Drive, Patriot, SuperSpeed USB 3.0, USB 3.0, USB Flash Drives, USB Technology and tagged Patriot, Patriot Supersonic USB 3.0 flash drive, Supersonic Flash Drive, Supersonic USB 3.0 Flash Drive, SuperSpeed flash drives, USB 3.0, USB 3.0 Flash Drive. Bookmark the permalink.